Kushiyaki (skewered and broiled food) of potatoes and soba dumplings from the local. 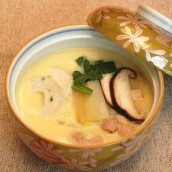 Dekomawashi is a local delicacy of Miyoshishi, Iya area. 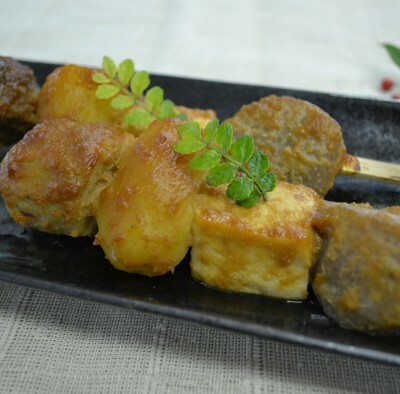 It is a broiled skewered potatoes called "goshuimo" from the local, soba dumplings, iwatofu and marukonnyaku. It was named dekomawashi because it was looked like spinning a head of a doll of the traditional arts, Awa ningyo joruri called "deko" when cooked, or when people spun and blew freshly broiled hot kushiyaki before eating. Wash satoimo and steam them, or microwave for 6 to 8 minutes. 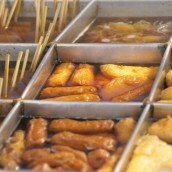 Once it become soft when tried with a skewer, peel them, and cut large satoimo into smaller pieces. Boil potatoes and peel. Cut konnyaku into 8 pieces, and boil. Cut tofu into 8 pieces. 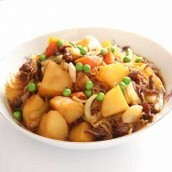 Mix soba flour and water, round into dumplings, put them into boiling water and cook for 2 minutes. 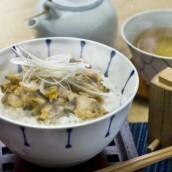 For miso sauce, put grated ginger, sugar, sake, water and wafu dashi into a pan, and simmer until it gets thick. Or microwave for 1 minute and mix well, and repeat it 3 times. Skewer konnyaku tofu, goshuimo, satoimo and soba dumpling into a 18 cm-long bamboo skewer, and broil. Paste the miso sauce over the skewer, and broil again. Place on aluminum foil, cook for about 15 minutes if using a toaster, for about 10 minutes on a grill over medium heat, or about 10 minutes in an oven at 180℃. Keep checking on them to prevent from overcooking.